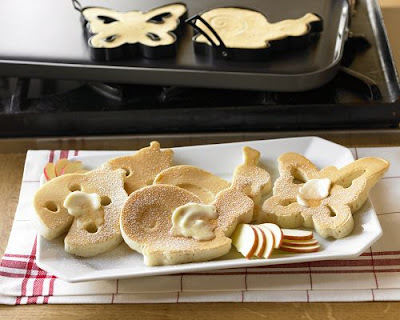 I was really disappointed that I didn't know about Williams Sonoma's Circus Cookie Cutters until after the set was discontinued, so I was really happy to see that they've introduced these Garden Creatures Pancake Molds! So fun! Pancakes are definitely my favorite syrup friendly breakfast treat, winning easily over waffles and French toast, so these are right up my alley! You can find a Williams Sonoma near you or order online by clicking here. Also, on the cute cookie cutter front, Ikea has introduced these adorable pastry cutters. For $4, you get six cutters, including one of a hedgehog! Order online here or find a store near you by clicking here. you DO love all things animal. these are so cute. These are way cute! Although, the drawback is I'd probably eat twice as many cookies or pancakes if they all looked this adorable.